For Many In Venezuela, Social Media Is A Matter Of Life And Death When it comes to social media, many Venezuelans choose to self-censor. But for others, social media can be a lifeline. One pharmacist uses Twitter to help people find scarce medicines. Health workers form a human chain reading "SOS" during a protest for the lack of medicines, medical supplies and poor conditions in hospitals, in Caracas on Aug. 2. For many Venezuelans, the relationship with social media is a tricky one. On the one hand, it is a valuable source of information in a country that censors all forms of traditional news media. It can be a lifeline for those seeking help, and a form of protest — the only way to speak truth to power. On the other hand, being too vocal on social media can have dangerous repercussions. Venezuela is one of the most violent countries in the world, according to the U.S. State Department. Guillermo says his friends living abroad are also very careful with social media. For him, social media is more dangerous than it's worth. But for Javier Rojo in Caracas, it's a lifeline. He's a pharmacist in a country with severe medicine shortages. "There are shortages of everything," he says. "Insulin is especially needed." Rojo uses the pharmacy's Twitter account to announce what it doesn't have — medicines people desperately need. For him, social media is truly a matter of life and death. In one recent post, he retweets a diabetic who was urgently seeking insulin: "We haven't had insulin for over a month." In another, he retweets someone looking for methotrexate, for arthritis. "We don't have this," he announces. "Please retweet." On occasion, a medicine is found. A lot of times, the tweets are like messages in a bottle — no response, no follow-ups. Since Rojo took over the pharmacy's Twitter account in February, it has grown from under 100 followers to nearly 30,000. One of the things that motivated him to get on Twitter was a phone call: A person was looking for an antidepressant, but learned they couldn't afford it. On the other end of the line, the person responded: "OK, I'm going to have to kill myself." Then the person hung up. Rojo says that call devastated him, and motivated him to double down on the pharmacy's Twitter account, which he had recently started. Eric Farnsworth, a Venezuela expert, says social media communication is critical in the country. "In some ways social media has been a lifeline for common Venezuelan citizens who don't have access to the normal newspapers or radio or television that they had been accustomed to when Venezuela was a democracy," he says. 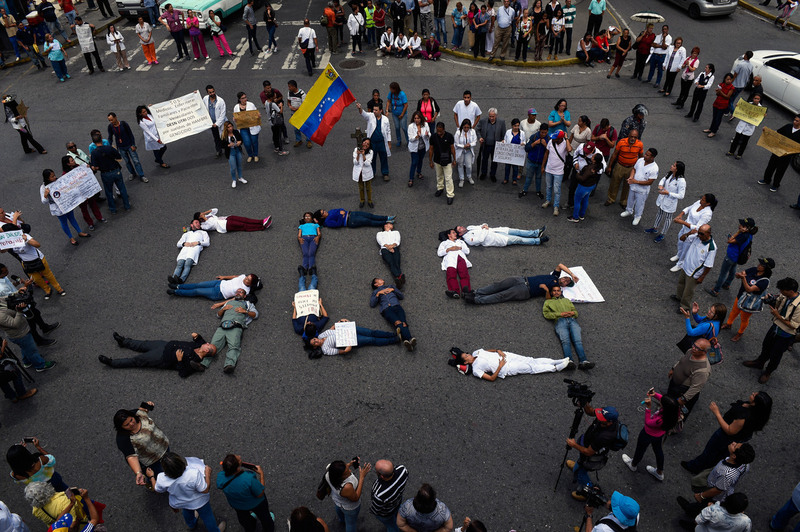 Farnsworth, the vice president of the Council of the Americas, a think tank and business organization, says social media can also be dangerous for many Venezuelans still living there. "There is a real self-censorship now in Venezuela," he says. "People are very careful about what they say, because you don't know who is listening. And you don't know who is hearing what you say to whom." That self-censorship also exists among many Venezuelans living in the U.S. — people like Guillermo, who stays anonymous on Facebook for his family's safety. But back in Caracas, Javier Rojo says, things have gotten so bad, he wonders: "What else could happen to us? What else?" Rojo suspects the government is already monitoring social media. He says you have to be careful and be subtle. A few weeks ago, in between his posts about insulin and ciprofloxacin, he tweeted about how sad it makes him to see people leaving Venezuela. dejamos de serlo el día que el prImero partió. esas Tonadas de alegría, paz. porque el recuerDo olvidado está. It was written mostly in all lower case. It would have been easy to miss the random letters he capitalized throughout the tweet: L-I-B-E-R-T-A-D.